I have always wanted to visit the Singapore Food Trail, which is a 1960s themed food street at Singapore Flyer and Food Republic Beer Garden at Harbourfront when they opened in early 2011. There was much hype when they opened but it seemed to have died down. Before this, our visit to the Food Republic Beer Garden was disappointing as only a few stalls were opened on a weekend evening and the customers were sparse. In fact, I have forgotten about this place until I chanced upon an ongoing promotion through its Facebook page recently. One item from each stall was at $2.50 instead of $5--cheaper than those at most Food Republic food courts. Since there are substantial savings, I decided why not head there for a try? When we arrived, there were visibly more diners than the one at Beer Garden, but not crowded. Starting from the Old Airport Road Satay Bee Hoon Stall, I flashed the FB e-voucher to the uncle. "Ni mei you print chu lai ar" the uncle said and I pointed out the instructions on the fb page. The friendly uncle accepted and relayed my orders to another uncle in charge of cooking. The noodles of the Satay Bee Hoon ($2.50) are well-strained so it was not too wet. More of that piquant gravy would be wonderful. Apparently, the stall that began since 1950s is famous for its gravy made from 15 ingredients, but lard is no longer used. The East Coast Lagoon Rojak was the star of that day. To be honest, we liked it more than the Kover Rojak because the sauce had the right consistency and a well-balance sweet and tangy taste. The best thing was the you tiao (dough fritters) which stayed fresh and crunchy till the end. Instead of Sambal stingray, we ordered the Yang Zhou Fried Rice from Boon Tat Street BBQ since it was the dish on offer at $2.50. Nonetheless, the rice was fluffy and spicy, with a strong whiff of wok hei. From the Bugis Street Ah Huat Hainanese Chicken Rice stall, we ordered half-a-chicken instead of the $2.50 plate of chicken rice as the Folks wanted more meat. The meat was tender and good, but not much different from those outside. Conclusion: Food here are delicious and it is a relief to see that most stalls are still manned by Singaporeans--the owners or their relatives. Price wise, they are similar to Food Republic without using the discounts. But many of the stalls were either closed (eg. Ann Chin Popiah ) or had permanently stopped operations. With an air of gloomy atmosphere among the hawkers, I hoped that the online promotions (till May 31st) can help to improve the business. But whether such concepts are sustainable in the long run remain a question. Various dishes are going at $2.50. Check out their FB page for the e-vouchers. Fika Swedish Cafe has been on my radar for quite some time as I wanted to try Swedish cuisine in places other than Ikea. Traditional dishes like the Inlagd Sill, pickled herring platter ($12.90) , usually served in Christmas, Easter with vodka can be spotted on the menu. However, that platter was not sharing-friendly because the work of splitting the tough hard rye bread can be messy. The marinated fish was as savoury as smoked salmon, but did not bind well with other ingredients (eggs, sour cream,onions and chives). Would it be better if they were served in canapés style? Since we wanted the Fika Swedish Meatballs and a dessert, the kids meal that came with a drink with the above at $15.90 sounded more economical. Portion might be smaller but sufficient. Similar to Ikea, in place of tomato gravy was creamy brown mushroom sauce that was not overly rich. The sweet lingonberry compote took the dish up a notch by balancing the meaty flavours. The meatballs have a slightly charred crust that trapped moisture within. Replace the meatballs with two huge beef patties, sautéed onions and you"ll get this Beef Pannbiff $18.90. They were less greasy than Blu Kouzina's version but the substantial amount of meat became overwhelming. Best recommended for sharing. Taste is rather similar to the meatballs so it's perhaps better to order either one instead of both. The Skagen Crepe $16.50 is a cold crepe that is filled with smoked salmon, shrimp and fish roe. More fillings might be good to hold up what seemed like a deflated roll. It did not have a notable taste and the mayonaise was slightly diluted. ﻿The Grilled Chicken surprised us with a smoky, well-perfected boneless chicken thigh in a subtle black pepper sauce. Only quibble was the undercooked parsley potatoes which were bulky and bland. The dessert, part of the kids meal is truly one of its kind. The Swedish Raspberry Cream in cold milk is a semi-molten huge dollop of raspberry jam jelly submerged in unsweetened cold milk. Instinctively, I mixed everything up like how I always played with the 80-cent cup ice cream from mama shops and transformed it into an odd but delicious pool of gooey liquid. The Chokladballs, or Swedish Chocolate Balls ($5.50 for 3) are refrigerator cakes aka no-baked cakes. Made of oatmeal, sugar, coffee, cocoa, butter then rolled in coconut flakes, this has a grainy, rustic texture similar to a compact wholemeal ball. All except the Skagen crepe (from Denmark) and the grilled chicken are marked as traditional swedish dish with a logo of a deer on the menu. Though not everyone will be used to Swedish food, it is fun and exciting to explore such unfamiliar cuisines as we may never know how it taste from the menu. However, the service was quite offending and harsh, a sharp contrary to the bright, inviting atmosphere. Ah Long Pancake: Traditional Mee Chiang Kueh? I love Mee Chiang Kueh but those commonly sold are thick, chewy with more batter than fillings. It was only recently that I found out from the Folks about the earliest form of mee chiang kueh. They were smaller discs of crispy pancake that looked like Apam Balik, often sold by uncles who make them fresh off the griddle. After a long hunt for the "ancient" mee chiang kueh aka 传说中的面煎馃, I was glad to have finally discover Ah Long Pancake at Lavendar Hawker Centre/ Food Square. It fits the description, only that they are no longer made in cast-iron hot plates that are still used to serve you hot plate tofu zichar. Plus, you get some novelty flavours like sambal and even durian. Lucha Loco, a place that sells gourmet mexican street food, has been receiving rave reviews since it opened last year and we were glad that our experience with the food there turned out to be an amazing and memorable one. I did not regret ordering the Elotes($8) despite knowing that it was just a corn. No, I should correct myself and say that it was an extraordinary grilled corn smeared with chilli, mayonaise and cotija cheese that burst out sweet juices in each bite. I never knew a corn could have such a great allure. Since tacos are the first thing that comes to mind for Mexican cuisine, we instinctively picked the Tacos de pesdacos ($11), which is the fish version instead of pork belly, beef or shrimp. Ceviche (raw fish "cooked" in lime and lemon juice) was another popular item on many tables but we did not feel like having it that day. The tender chunks of grilled snapper dressed in chipotle mayo was smoky and slightly fiery. Admittedly, the tortilla skin was rather stretchy, but that extra red pepper salsa added a desirable crunch and zest to it. I imagined the Crab Tostaditas with habanero, avocado and cucumber ($16) to be crunchy and creamy but somehow the dish did not deliver the taste. They were on the light, bland side. Our favourite was this vegan dish, Chiles Relanos($24), an ugly-looking roasted poblano pepper stuffed with rice, herbs and wild mushrooms. Every spoonful of filling with the heavenly pumpkin sauce simply lifts up your mood. So delicious that I did not mind skipping other meaty mains. Can you spot some yellow corn? As a dessert lover, I was sad to see only two items but ended up extremely pleased with the Pastel de Elote Azul ($14), a crumbly cake made with blue cornmeal topped with mezcal alcohol-spiked whipped cream. (Though it was served after 20min and not 5min as informed by the waiter) Moistened with agave nectar, the cake had a unique coarse texture and a subtle sweetness. Who says good cakes must be light and fluffy? This one is divine--a MUST TRY. To conclude, this is definitely the place to go for some authentic Mexican street food. If you are coming here for a full meal, I recommend that you order the main meal that are larger in portions as prices adds up when you order those small-sized appetizers. Dairy and Cream Turns 2! In this coming May, Dairy & Cream (blog) will be turning two! I began writing food reviews in Chinese (yes, I am still quite shocked when I looked at my early posts) and switched to English, with an occasion mix of Japanese. Thanks to this blog, I have learnt a lot and make new friends. But till now, I am still learning how to best express my food/travel experiences into words. Although the current page views at 97, 606 (approaching 100,000!) and Facebook Likes of "100" might seem insignificant to many people, I am happy that the audience has grown significantly, especially within the last 8 months. I really appreciate every single count and hope to keep this blog as real and personal as possible. Once again, thank you for your support and hope that you continue to join me in this journey. Every small "click" from you, One giant leap for me! To show my appreciation, I would like to give out A Pair of Tickets to Hyun Bin 玄彬 First Asia Fan Meeting Tour (worth $396) held at The MAX Pavilion@ Singapore Expo Hall next Saturday 27 April 2013 to one lucky reader to enjoy with his/her loved ones! 1) LIKE Dairycream's Facebook Page and SHARE this facebook picture on your timeline. Thanks to an invite to Bugis Food Trail 2013 organized by omy.sg and Capitaland Malls, I had the opportunity to try out various food with other bloggers at Bugis Junction, which is conveniently connected to the Bugis MRT. Starting with a hearty brunch at Everything with Fries, we proceeded to Platypus Kitchen for some excellent pasta. Since it was still early, we headed to Nanxiang for dimsum. Later, the spicy and sour Thai cuisine at Siam Kitchen perked our appetites again for more udon at Kazokutei. By then, it was 3pm, coincidentally the perfect time for a afternoon tea break of mudpies and cheesecakes at NYDC. To shield away from the blazing hot sun, we went to the sea, Fish & Co for fresh seafood catch, before having shiokingly spicy delicacies at Hong Guo. We wanted to call it a day after savouring the deep fried snacks at Yummi Bites but the sound of ringing bells attracted us to Maggie Moo Ice Cream shop. 7 hours. 10 shops. Please click on the above links which will transport you to each "lengthy" post that I have sincerely pen down. 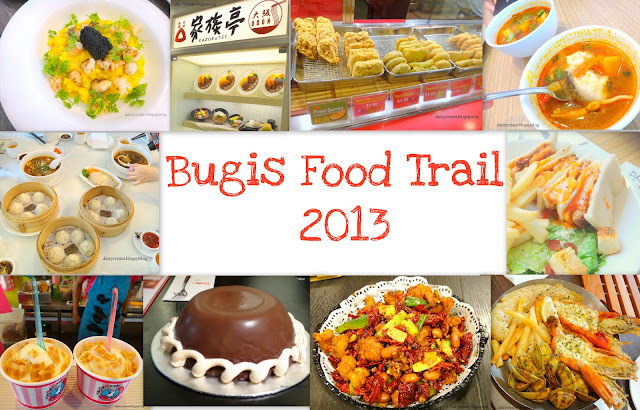 Once again, thank you fellow bloggers and all the organizers behind Bugis Food Trail 2013. Hope everyone will enjoy reading and trying out the food that I have recommended! Maggie Moo, not Maggie Q or Maggie Mee, is another ice cream chain that helms from US, just like NYDC. When me aka dairycream reached that place, I thought I had found my twin sibling. 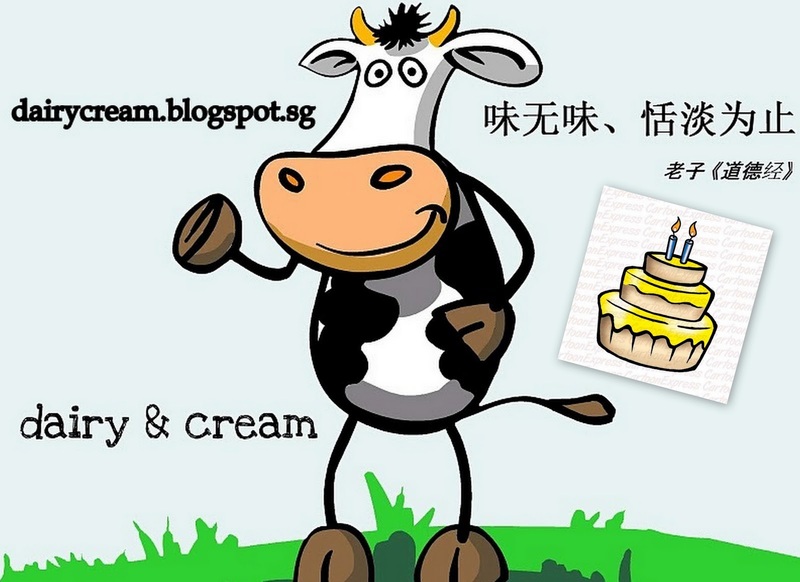 Don't you think the mascot Miss Maggie Moo look like my avatar (**profile pic of my fb page)? Okay now back to the 6 ice cream flavours which we tried. Their signature item is the (top left) Cotton Candy Ski Jump with M&M and mini marshmallow. It stains your teeth blue but does not taste too artificial. And you don't have to be a kid to enjoy this! The least sweetest ice cream was the Chocolate 2 the Extreme (top right), packed full of dark chocolate. If you don't like Red velvet : red velvet cake w pecans choc cake n fudge (bottom right), there is also Mango Madhouse (bottom left) is a refreshing option. FYI: no durian ice cream. Two of my favourites are Vanilla Cookie Dough Yoyo (vanilla with cookie dough Oreo and fudge) and Cheesecake with Teddy Graham's fresh strawberries and caramel. All pictures here show the Maggie Moo Size (middle-size 5 oz cup) at $6.90. The smallest size is Lil Moo (3oz) at $4.90 but feel free to upsize to The Moother, Grand Mother or The Stampede !!!! And that is the 10th and final stop of our Bugis Food Trail 2013. Click HERE to find out what we had on the earlier stops. 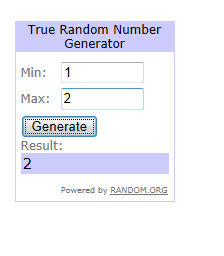 Thank you for reading all 10 posts. If you enjoy reading my blog, feel free to "like" my facebook page at www.facebook.com/DairyandCream or follow me on Instagram for future updates! Thank you! I have always walked past Yummi Bites without realizing that the snacks they are selling have been highly raved in the media and press. All the deep-fried food here are best consumed hot. But if you were to takeaway and consume them after several hours like what I did, the good news is the batter remain crispy and not oil-logged. So the question is : Which one to try? Their bestseller and the most expensive one is the durian fritters ($2.50). But they are worth every cent because you see what you get--95% real luscious durian flesh and 5% crunchy coating. Plus, the frying method somehow eliminated some of the (pungent) smell, the fear factor of some people. My favourite is the Nian Gao 3-in-one($1.60), a twist of the usual nian gao sandwiched between yam and sweet potato. The nian gao is chewy, but does not stick to your teeth. The green bean ($1.00) is smooth but not too dense nor overly-sweetened. In the spirit of sharing more food, I went to the branch at AMK hub and bought some savoury items to try. The cheese potato balls ($1.80) drizzled with melted cheddar cheese are not creamy like croquettes but a more compact hashbrown minus the nauseating greasy odour. Instead of goreng pisang, I chose the jackfruit($1.20), which surprisingly had a more intense fragrance than the durian. If you like fried snacks, this place might be convenient stop for you to grab a quick bite before you rush for your train. This is the 9th stop of Bugis Food Trail 2013. Click HERE to read about other delicious food in Bugis Junction. Hong Guo, is a Chinese restaurant that specialises in Yunnan and Si Chuan cuisine. And speaking of Yunnan, what could possibly be a better food representative than 过桥米线(Cross over the bridge vermicelli)? At $8.80, you"ll get a huge pot of rich white broth with 15 types of ingredients, and the first thing to be added is the raw quail egg, followed by the meat(prawn,squid,ham) then vegetables. The broth is nourishing and delicate, with mild taste of ikan bilis. Finishing this bowl of soup is not a big problem since no MSG was added and there wasn't any oil layer as of the traditional recipe. The Sze Chuan Basket in Chicken ($6.80)was an excellent dish of bite-sizes crispy chicken spiced up with dried chilli and an inspiring touch of roasted peanuts. But those who can't take spicy food should stay away from this dish especially the Sze chuan peppercorns which can anesthetize your tongue instantly. The hot favorite at the tables were undeniably the Pumpkin fries ($6.80), which are deep-fried pumpkins batons coated with powdery salted egg yolk. Not exactly like crisp-like fries, the version here is squashy but still finger-licking good to qualify as a sinful delight. One can detect the wok hei in this Lotus XO Seafood Fried Rice ($8.80) and the subtle tones of chilli that adds substantial heat the dish. Compared to the fried rice at Crystal Jade or Paradise dynasty, the version here is more moist and flavorful, but fortunately not too clumpy. The XO fried seafood noodle ($8.80) that came with an enticing fragrance, was wiped out very fast. The noodles stir fried with dark soy sauce had a sweet unami taste and a pleasant springy bite. My eyes lit up when I saw this Minced Pork Lettuce Wrap $6.80 because I can't resist any food that are wrapped (popiah, Peking duck crepe etc). The wrap did not disappoint with its rich combination of textures and sweet-spicy flavors packed snugly in the fresh lettuce. But the filling can stand alone on its own and goes well with white rice. Surprisingly, I found myself to like the chinese food here, especially the Fried Rice and Sze Chuan Chicken. Perhaps it was the strong spicy flavors that captured my tastebuds. Nonetheless, this is another noteworthy place to go for if you are seeking to try some very affordable Chinese food (mostly below $10) in a cooling environment. 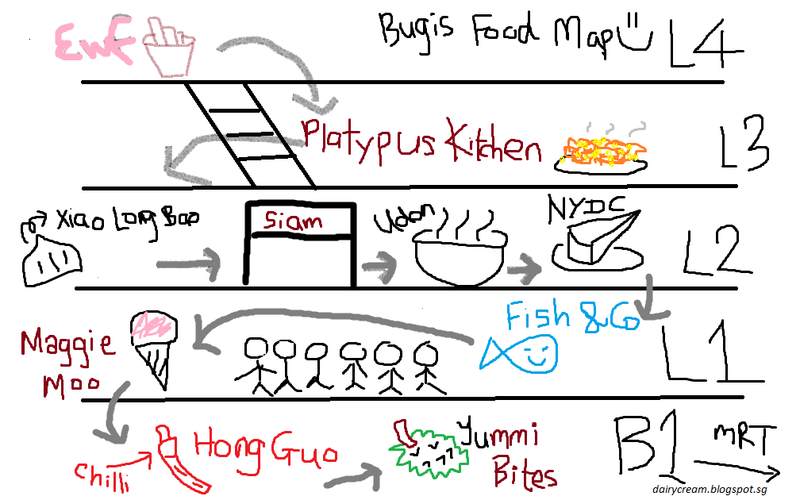 This is the 8th stop of Bugis Food Trail 2013 organised by omy.sg and Bugis Junction. Click HERE to return to the main FOOD map. Fish & Co : Brand New Menu!